Dr Ad Konings tracks Tropheus moorii and its relatives around Lake Tanganyika. As far as I know every rugged coast on Lake Tanganyika harbours a species of Tropheus, and at least four species there show great geographical variability. The genus Tropheus is currently composed of at least eight species: T. moorii, T. annectens, T. duboisi, T. brichardi, T. sp. ‘black’, T. sp. ‘red’, T. sp. ‘mpimbwe’ and T. sp. ‘ikola’. However, almost all Tropheus species are referred to in the aquarium hobby as T. moorii, which has confused enthusiasts and scientists alike, yet T. moorii, the type species of the genus, has a restricted distribution in the southern part of the lake. Its northern counterpart, T. sp. ‘black’, exhibits very similar behaviour, but at a small rocky outcrop along the central coast of Tanzania at Lyamembe. Both species can be found sympatrically, indicating that these really are two different species. Tropheus moorii has a feeding relationship with several species of the genus Petrochromis. The latter are algae grazers which mainly comb loose material, including some sediment, from the biocover. Sites grazed by these species contain less sediment and are favoured by Tropheus. Takamura (1984) has described this for the northern T. sp. ‘black’, but I have seen this behaviour in southern Tropheus species as well. On many occasions, a Tropheus species is not chased from the feeding territory of a large and aggressive Petrochromis, but allowed to feed on the already-grazed areas. 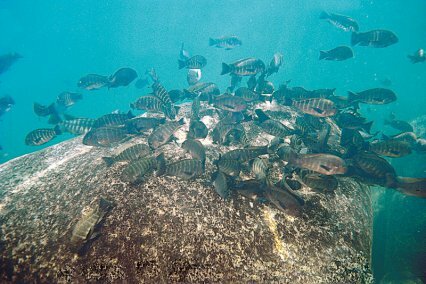 Such sediment-free browsing sites are limited, however, and you can see large foraging schools, numbering hundreds of individuals of a single Tropheus species, roaming through the rocky habitat and feeding at preferred sites. These are too heavily defended to be accessible to the individual, but force of numbers permits them to be browsed. Tropheus species are maternal mouthbrooders. Kawanabe (1981) found that a female is allowed in the male's territory for up to three weeks prior to spawning, but she leaves the male's territory after spawning and hides among the rocks. I have seen territorial male T. moorii chasing some conspecifics from their premises but ignoring others, suggesting that this species forms a relationship between male and female before spawning. Mouthbrooding females forage carefully from the biocover to feed the fry inside their mouths and probably also themselves, although they appear emaciated after four weeks of mouthbrooding. Females guard their offspring for a few days after release for the first time and the young are freed in extreme shallows among pebbles and small rocks. The type specimen of T. moorii was caught at Kinyamkolo, the former name of Mpulungu in Zambia. The fish found, actually a few miles west in Kasakalawe, is called ‘Sunset moorii’ in the trade and characterised by an orange blotch on the flanks. T. moorii is from the central-west coast of the lake, south of Moba in the Congo, through most of the southern portion of the lake in Zambia and along the south-eastern part of Tanzania. Most geographical variants found in Tanzania are rarely imported, except for the beautiful ‘Red Rainbow moorii’ which is common along the rocky shore south of Kasan-ga. This fish shows a large gap in distribution along the eastern shore of the lake: between Kisambala and Sib-wesa, a coastline of about 200 km/124 miles, it is absent, but a relict population occurs at Lya-membe, at a few kilometres north of Sibwesa. This population of T. moorii is sympatric with T. sp. ‘black’, the so-called ‘Kirschfleck moorii’, and with T. annectens. The distribution of T. moorii along the Zambian and Congolese shores also exhibits a gap, specifically between Nkamba Bay in Zambia, and Kiku in the Congo. In this gap there’s T. sp. ‘red’, a species closely related to T. moorii. South of the Kalambo river, along the eastern side of Chituta Bay in Zambia, there’s the red-eyed ‘Chisanza moorii’. This Tropheus, as well as being basically a very attractive variant, exhibits so-called OB (orange-blotch) polychromatism which makes some specimens extremely colourful. Such coloration, well known from many mbuna of Lake Malawi, is rare in Lake Tanganyika. I have seen blotched T. brichardi, but these didn't have an orange ground colour. The OB forms of T. moorii are known as ‘Golden Kalambo moorii’ in the hobby and the special coloration occurs only in fully adult individuals. As well as the true OB specimens, a larger population of forms with yellow edges to the dorsal and caudal fins is found in the same area. Some are probably young adults which will develop the true OB pattern when mature, but others exhibit the yellow-edged pattern when fully adult. The rocky habitats along the eastern side of the Chituta Bay are rather small, and so are the populations of T. moorii inhabiting them. Small and possibly vanishing populations may have led to the appearance of these OB morphs, as more individuals are inbreeding than they would in large populations. Not only for protection but also for food, these cichlids are restricted to the upper rocky habitat. All are algae browsers which shear and tear the algal strands from rocks and avoid the ingestion of inorganic sediment. The outer teeth of the species are bicuspid and set closely together, forming a tight row with which the fish can grasp individual algal strands severed from the substrate by biting or, most often, by pushing the head upwards, using the pectoral fins, while holding tight to the strands. In the aquarium, quality Spirulina-enriched flakes are the safest type of food offered. T. moorii lives in the upper rocky habitat usually less than 7m/23’ deep. The rocks do not necessarily have to be a particular size, but where relatively small rocks of 30-100cm/12-39” create a myriad of hiding places, the populations of Tropheus are most dense. The upper regions of most rocky areas in the lake are ruled by species of the genus Petrochromis. These are relatively large algae-feeding cichlids which aggressively defend feeding areas. Although this behaviour is concentrated against conspecifics and other Petrochromis species, it is also directed towards most other algae-feeding cichlids. Tropheus species, although often described in literature as the most advanced or most abundant cichlids of the rocky habitat, play a rather subordinate role when sharing the habitat. All Tropheus are territorial and most males have rather large feeding territories, sometimes with a diameter of more than 1.8m/6’. Conspecific males, and often females too, are chased from such areas. Females also have feeding territories from which conspecific females are chased, but these are neither very large nor aggressively defended, as it is not uncommon to see a few individuals feeding from the same small rock. All Tropheus species in the aquarium are territorial and relentlessly chase conspecific males. Females are courted continuously and often aggressively chased when not ready to spawn. The only way to keep these species in captivity is in a group of ten or more and the sexes of Tropheus can be relatively easily determined by examining the vents. Feeding these species is the most difficult part of keeping and breeding. The safest food to give these vegetarians is Spirulina flake and a suitable, good quality flake will be sufficient to get these cichlids into breeding condition. Also recommended are Cyclops, Mysis, and other planktonic crustaceans and it is important that the frozen food must feel rough to the touch and not soft or slimy. Feeding red or white mosquito larvae, Artemia, beefheart and other soft, easily digestible food can be lethal for these fishes. Do not feed these fish more than once a day. Almost all commercially available dry foods contain lots of protein and fat, and, in the aquarium, these cichlids can eat more of these nutrients in two minutes than they could eat in an entire day in their natural environment. Algal growth on the aquarium décor, promoted by strong lighting, will provide an additional food source. Breeding Tropheus species is difficult for several reasons; the most important being that the male wants to spawn every minute of the day! In addition, females are not easily conditioned. They don't need a lot of food but just the right type. Mouthbrooding females can be removed at night in total darkness and placed alone in a nursery tank. They may hold up to 20 eggs per spawn and let them take care of the fry until a week after their release. Never add new individuals to an existing group when keeping and breeding. If such a group has to be expanded then all individuals of the new, expanded group must be placed simultaneously in a new aquarium — or one where the décor has been rearranged to obliterate previously existing territories. In the aquarium Tropheus are best kept amid very rocky décors with many hiding places. These are important for sub-dominant fish to hide from the alpha male’s view. As long as each individual of the group has a safe place to retreat, there will be harmony in the aquarium. …put different geographical races of Tropheus or individuals from different localities together in the same tank as this frequently leads to unwanted hybridisation. Tropheus can be housed with as many males as females. Kawanabe H. (1981): Territorial behaviour of Tropheus moorei (Osteichthys: Cichlidae) with a preliminary consideration on the territorial forms in animals. Afr. Stud. Monogr. 7: 101-108. Takamura, K. (1984): Interspecific relationships of aufwuchs-eating fishes in Lake Tanganyika. Env. Biol. Fish., 10: 225-241.